Think the garage is just a place to park the car and store the melange of lawn maintenance, car care and home repair items? Think again. 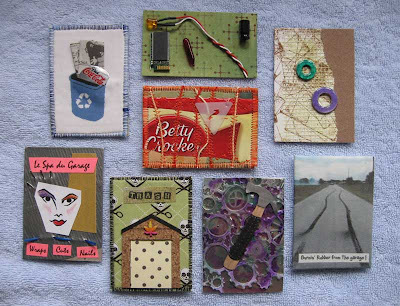 ATC (artist trading card) artists found both inspiration and unique materials for their artist trading cards "From the Garage" at this month's ATC swap. Remember the first Apple computers? They were built by Steve Wozniak and Steve Jobs in the garage, and since then, the computer world was forever changed. The garage's recycle bin and workbench was a good source for art materials including washers, nails, sandpaper, line for the weed eater, and of course the end-all and be-all garage staple: duct tape. An interpretation of reality show, Monster Garage, incited the saying on the back of one card: "You can take him out of the garage, but you can't take the garage out of him." Whether you have trash or ATC treasures in the garage, when all is said and done, you can "Burn rubber from the garage!" on your way out. 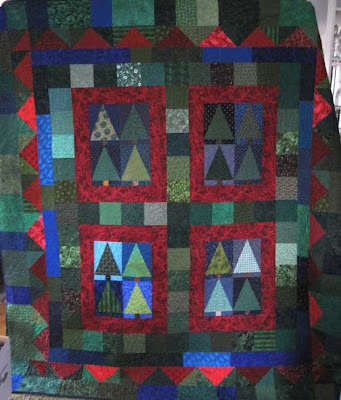 Original entries submitted to the "Quilt It!" contest were required to incorporate three of the following five elements: 1) bird/s; 2) mountains; 3) sliver fabric, thread or item; 4) recyled/repurposed material; 5) beads. 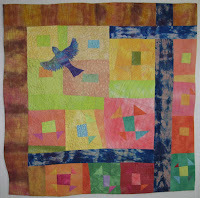 My entry included a bird, silver thread used in the free-motion machine quilting, and over 95% of the fabrics were hand-dyed or over-dyed using shibori techniques. 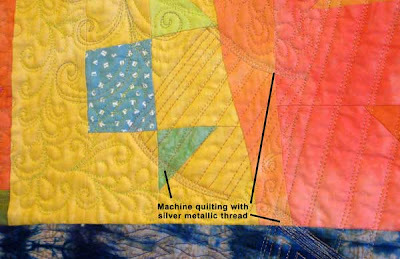 Here is a detail view of the metallic thread used in the machine quilting. I'm awaiting delivery of the prize: a library of Lark's quilting books. You can't have too may books—especially when the subject is art quilts, quiltmaking, and textiles. Yipee! Do you have quilt tops waiting to be quilted? Do you want to complement your straight line quilting with free-motion designs? Do you want to get more from of your sewing machine? Join me for a machine quilting workshop and ... Break free with free-motion machine quilting! On March 27, I'll be teaching a free-motion machine quilting workshop. 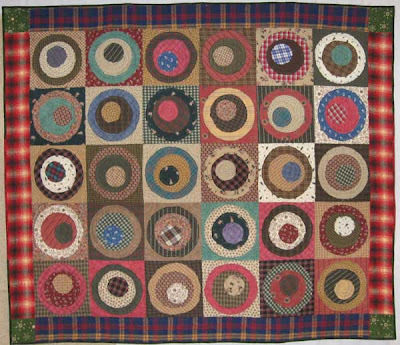 In this workshop, students will learn the basics to get started with no-mark free-motion machine quilting. The topics covered include sewing machine set-up, quilt preparation, and choosing materials and tools for a successful project. You'll work with continuous line patterns that can be used with traditional or contemporary quilt styles. This is an introductory class—no free-motion quilting experience is necessary. The workshop will be held at Alexian Brothers/Senior Neighbors, 10th and Newby Streets, Chattanooga, TN. It is a full-day class from 10 am to 3:30 pm. To sign up, send an e-mail to me at veronicaquilts@gmail.com. You already use your sewing machine for piecing your quilt tops. Now, come and learn how you can also quilt those tops with your sewing machine! Besides getting organized, Sorting the Stash has the benefit of finding quilt tops you forgot you had. Some of you may laugh—you know who you are—because you know it's true. (Truth is always funnier than fiction). 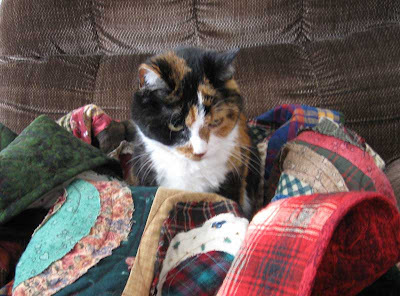 After collecting flannel fat quarters, I had enough variety to make one of those raw-edge flannel quilts. Remember them? The kind that after several cycles in the washer and dryer, the raw edges fray and "bloom." The top was completed some time ago and recently resurfaced. All that remained was the quilting and binding. Now it is finished! My husband, a baseball fanatic, likes this one. So, I named it "Strike Zone." China, our little kitty, likes it too. They both share it. You can't give to one without giving to the other... so they say. This becomes especially apparent when Brother #2 is present when Brother #4 receives the "Cabins in the Pines" quilt. "Where's my quilt?" says Brother #2. They also say... "If you don't ask, you won't get." And, Max is not bashful about asking. Over the years, I've made several signature quilts, retirement quilts, birthday and get-well quilts for friends at work—all female co-workers. I think it's easy to make quilts for women and kids because anything goes. For a guy, however, who won't sleep under those "flower-y Hawaiian-looking bedspreads," a quiltmaker must scrutinize more carefully the choice of pattern and fabrics. So, here is Max's quilt, "Checks and Balances," (named by Brother #1) which I believe has met the bro-criteria. 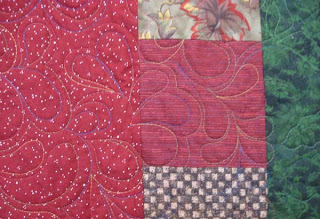 I free-motion quilted it with loopy free-form feathers over the center section and vines and leaves in the green outside border. 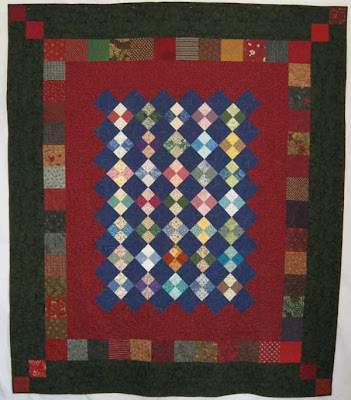 A colorful variegated cotton quilting thread was used. [Finished size: 66" x 77"; 7 bobbins.] This was quilted on a domestic sewing machine—my Janome 6500. I got a tip from my MIL that two of my BILs would love to have a quilt from me. (My husband is the eldest of four boys, so I was blessed with three extra brothers when I married into the family.) I checked my piles for suitable blocks and UFOs that could blossom into a suitable bro-quilt. Sometimes we can uncover "diamonds in the rough" when looking through extra blocks and pieces that weren't ready for prime time when they were originally made, but as time passes, opportunities come into focus for their raison d'etre. This was the case with Jason's quilt. Here is the growing of Jason's quilt. 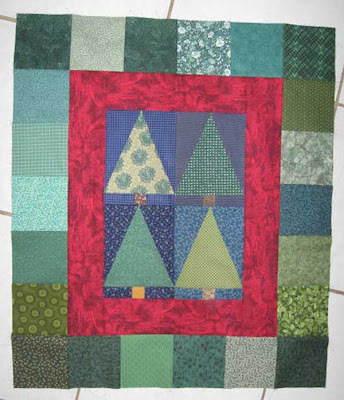 The tree blocks were the inspiration for this quilt. 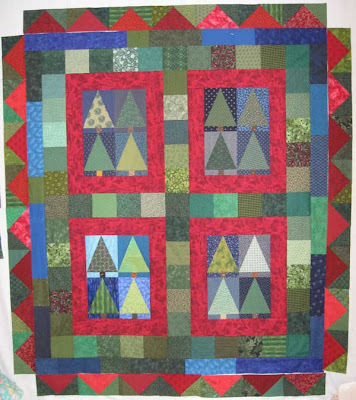 I framed the tree blocks with a red border so the dimensions of the 4-block center would be equivalent to the strips of five inch squares. This pieced section is about 27" x 31.5". I had three sets of the trees and needed to make one more. The red flying geese blocks echoed the red in the sashing. I recreated a pattern for the tree blocks to make the last 4-block. The fourth set of trees completes the center and the flying geese units form an interesting frame. I then found out that this quilt was for a queen size bed. An additional inner border was added in blue. The colors are distributed, the bright blue fabrics provide sparkle and allows the eye to move around the quilt. Still not large enough... The final scrappy green and dark blue border provided a ground for the geese. Here is the finished quilt. 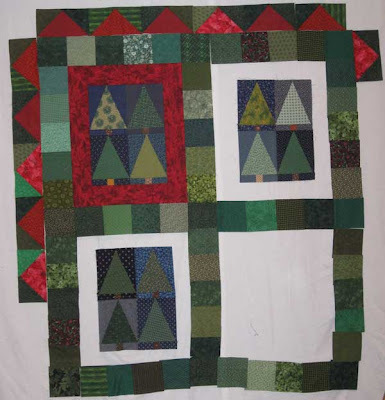 The back was pieced with an inset of log cabin blocks and a strip of the 5-inch patches. 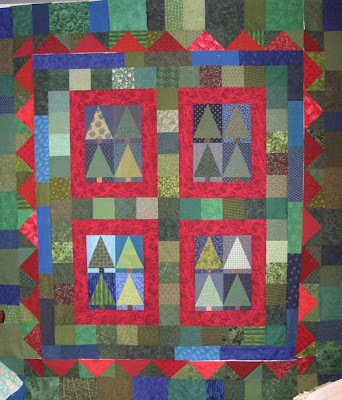 With the help from a few quilting friends, this quilt is named "Cabins in the Pines." 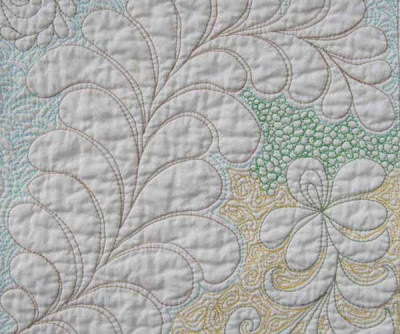 It is free-motion quilted with large branches, fronds and leaves in a variegated cotton thread. [Finished size: 75.5" x 82.5"; 9 bobbins used for quilting.] 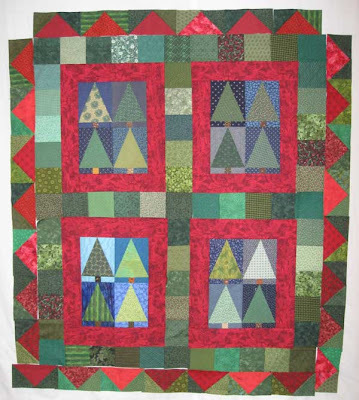 From a few surplus quilt blocks came a queen-size forest. The quilt was very well received and much appreciated.